A reader's Roofs and roofing question: Fixing skylight? Rahamut M. from Freeport, Trinidad and Tobago had this fixing skylight question. I am installing a skylight on a roof with galvanize...the one with the wide ridge. There is no information on the net as to how to do this to prevent leaks. Can you help here. the skylight is of the self flashing type. It has been a while since I fixed any skylights, but I remember that the manufacturer's instructions made it all sound easy, but they were not very detailed. Fixing skylights - A soaker flashing to a dome light. On a square skylight it only needs to go over the top edge of the skylight. When you have your hole cut in the roof, make sure that you turn up the pans of the roof sheeting at the bottom of the hole, that is the part that the bottom of the skylight covers, This stops wind blown rain from getting in. At the sides you should have at least the same overlap as the overlap on your sheet joints. That is at least one crest. 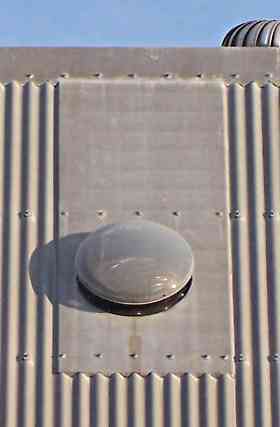 The sides of the self flashing skylight should go over a crest and down into a valley. The top is the tricky bit, they usually say for you to cut slots in the sheets and slide the skylight flashing under. This is not easy and there is always a small bit that needs some sort of sealer. I try to do this as they say, as neat as possible, but then when the skylight is just about installed I get a soaker flashing made up that tucks under the roof ridge flashing and comes down to the top of the skylight. If you can't get a soaker flashing made up, you could get a couple of short sheets of the roofing material, and fix them over the existing roof sheeting. Take the roof screws out of the old sheeting above the skylight, but leave the old sheets in place, just put the new ones on top of the old ones and make sure that you get a good lap over the skylight. Skylights are tricky, but they are great when installed, they change the room completely. Don't let any worries about leaks stop you from using them as they are a brilliant way to charge the feel of a room.